The summer of 1984 was pretty damn awesome for movies and as a 13-year-old movie lover (now you know my age), I was in my glory. I'm about to sound cliché here, but seeing Ghostbusters pretty much made my summer and to this day, has influenced me in some way or another. Hell, I write for a site called Paranormal Pop Culture and I'm going on a ghost hunt this weekend. I even took my son to see the theatrical re-release of this film and I cried when it began. So here's the deal, I have strong opinions on the making of a third Ghostbusters movie and based on private discussions, I'm not alone in my thinking. The possibility of a third Ghostbusters film has been tossed around for years now and pretty much right off the bat, Bill Murray said he did not want to be a part of the film. We may never know exactly why but good for him on standing his ground. With passing of Harold Ramis (Egon) and the subsequent distancing of Ivan Reitman from the project, it looked like this film may not come to fruition. I was fine with this possibility. A third Ghostbusters is not only unnecessary in a day and age where we are bombarded with shows about "busting" ghosts, but it is not a Ghostbusters film if there is an all-new cast and premise -- it is a "ghost hunting" film. That is fine! Go for it -- good luck with people paying to see it when they could just turn on their TV for free. There is even funny ghost hunting programming out there you can enjoy if you want a laugh; case in point: Jack Black's "Ghost Ghirls." Speaking of "ghirls," I just wrote about Bill Murray's suggestions for female leads in what is shaping up to be an all-female team of huntresses (bustresses?). What I am finding regarding this possibility is very interesting. Many genuinely love the idea...or at least that's what they're saying. Others hate this possibility, and very few people (male and female) will diss this idea for fear of looking like a soldier in an anti-feminism rally. Well I'm going to because I have the correct "plumbing." I'm not a fan of this at all. How about just making a stand-alone film about female ghost hunters instead of slapping the Ghostbusters label on it and milking the franchise? The possibilities are endless. Older women, women of color...bring it on, but for Slimer's sake, don't cross the streams. Overall, my opinion doesn't just involve the female casting news surrounding this film, but the making of the film at all. I'm not in favor of it and it should be left alone. It's not new and fresh like it was in the 80s when the possibility of walking around with cool and innovative equipment and looking for ghosts was not so mainstream. 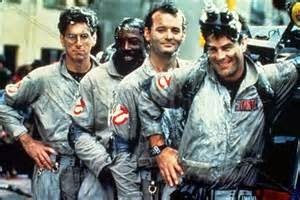 Unless the four dashing men with Proton Packs, Ms. Weaver, Ms. Potts and Mr. Moranis are all involved, it's not a Ghostbusters film. Now feel free to sound off with your opinion. I can take it...I'm a tough old gal. Like the one in the opening scene in the New York Public Library. I totally agree! Hollywood has been traveling down a road for over the past decade of rehashing old ideas and trying to "update it for a new audience". Why not just do re-releases of the old stuff? I think "Gone with the Wind" is going to be in theaters again soon too. I don't need a remake with George Clooney as Rhett Butler and Catherine Zeta Jones as Scarlett O'Hara (or fill in with other hot commodity actors to sell a film like that). With the exceptions, like Lord of the Rings, Harry Potter, even horror movies like Paranormal Activity, there are fresh ideas out there that can become a hit and create sequels that can also hit. I think Ghostbusters was the first movie I saw in the theater at age 4, and I'd hate to see it's name ruined over a half-assed remake/reboot/rewhatever. Great article, by the way.